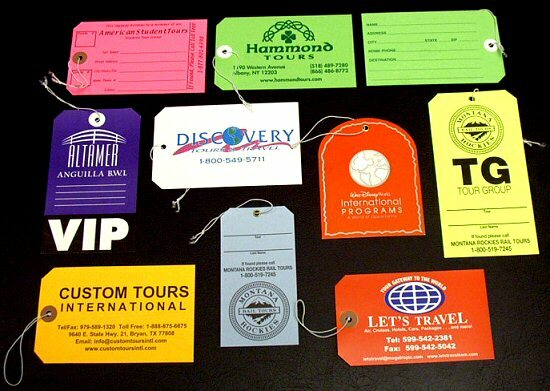 WORLD TRAVEL TAGS produces custom paper card stock tags used when lower cost and temporary identification is desired for groups traveling through tour operators. These tags are made of sturdy .013” (175 lb.) card stock with a grommet and attached elastic loop. Our standard tag measures 3 1/4 inches x 5 1/4 inches although several other sizes are available; all in many standard and neon colors. Printing of a logo and/ or text can be done on one or both sides of the tag. Please contact us with your specific needs so that we may give accurate pricing and production information. Several examples of these tags are shown below.